Managed DAVx⁵ is a version of DAVx⁵ that contains mass-deployment and configuration features for organizations. This configuration is used in the Managed DAVx⁵ UI and for new Managed DAVx⁵ accounts. Existing Managed DAVx⁵ accounts on your devices won’t be modified when the managed configuration is changed. Android Enterprise is the recommended method to configure Managed DAVx⁵. With Android Enterprise, IT departments can deploy apps to managed devices and configure them in a standardized way using MDM software. Apps are configured by managed configurations (sometimes called restrictions) which can be set in the MDM software for every deployed app. You can configure Managed DAVx⁵ using MDM/EMM software. Do not join unsafe WiFi networks when you use network configuration. Other networks might offer other Managed DAVx⁵ configuration files, which could lead to confusion. To avoid this problem, only join well-defined WiFi networks (or use Android Enterprise instead of network configuration). When accessing the configuration file, PKI is used to verify the TLS certificate, so a self-signed certificate won’t work without adding it to the Android device first. We recommend to put the configuration file to a location which is accessible over a trusted certificate. You can then define custom trusted certificates in the configuration file. Managed DAVx⁵ caches the configuration file which is fetched from the network so that Managed DAVx⁵ configuration is available when there is no network access (and for the time when Managed DAVx⁵ has been started, but the new network configuration is not ready yet). The cache will be overwritten when a new configuration file is downloaded. To reset the cache without a new configuration file, use: Managed DAVx⁵ / About/License / Managed configuration / Reload configuration. The configuration file is cached when it has been downloaded from the network according to the rules of the HTTP protocol. For instance, if the Web server which hosts the configuration file returns a freshness period of one hour, Managed DAVx⁵ will always use the cached version for one hour. However, the configuration file will be downloaded at least once a day (max-age: 1 day) to avoid problems caused by obsolete configuration files. If there is no Expires, the cache will use If-Match and If-Unmodified-Since. It’s advisable to set an expiration time for the configuration file on the Web server (for instance, one hour) explicitly to avoid unnecessary network traffic every time Managed DAVx⁵ is started on a device. 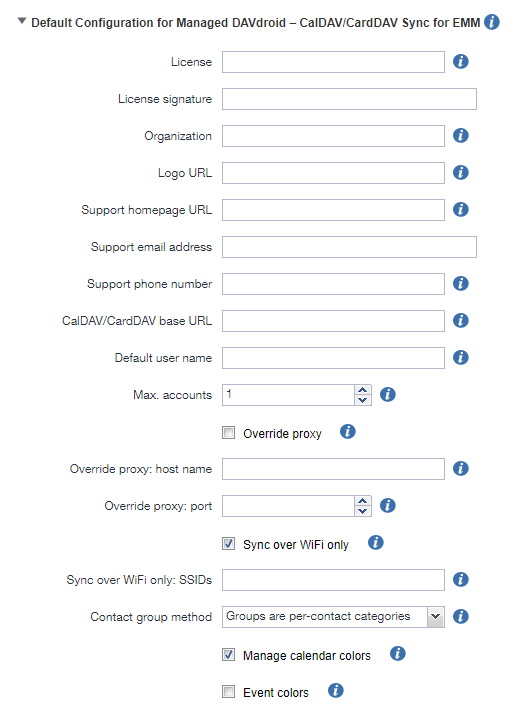 link to the configuration file on some page in your Intranet, and use your browser to open it with Managed DAVx⁵. To use the QR code method, a QR code scanner app has to be installed first. You can see and reset the current configuration file URL in Managed DAVx⁵ / About/License / Managed configuration. Managed DAVx⁵ tries to resolve the SRV and TXT path records of davdroid-configs.local in the local network. In case of success, the resulting URL (https scheme, domain and host taken from SRV, path taken from TXT path, or / else) is used to fetch Managed DAVx⁵ configuration. In this case, Managed DAVx⁵ would try to access the configuration file at https://internal.example.com:443/davdroid/davdroid-config.json. Managed DAVx⁵ can discover a service called davdroid-configs._tcp using DNS-SD. The network configuration file URL (https scheme) will be built from the host and path parts of TXT records (the SRV record is not used because the discovery service is not the same as the referenced configuration). If no host is specified, the host name of the host running the avahi service is used. If no path is specified, / will be used. In this case, Managed DAVx⁵ would try to download the configuration file from https://internal.example.com/public/davdroid-config.json. Managed DAVx⁵ watches the device for a file named davdroid-config.json in the app-private directory (package identifier: com.davdroid.managed) on the external storage, for instance /storage/emulated/0/Android/data/com.davdroid.managed/files/davdroid-config.json. If no other configuration method is active, you can put a configuration file to this location (using a regular file manager app or adb). Changes in this file will be applied immediately. This method is only recommended for debugging/testing purposes, for instance if you want to test the configuration file without the influence of potential networking problems. Other apps with the external storage permission may read/write the Managed DAVx⁵ configuration file. To avoid this security risk, don’t use the local configuration file method.